Today at its event in New York, Spotify CEO Daniel Ek announced a new Discover Tab, which gives you recommendations alongside album reviews, concert listings, playlists and more – all personalized to your listening. In addition, Spotify introduced a new Collection tab, which brings together all of your music (instead of fussing with playlists), and a Follow tab, which allows users to follow influencers and top users like Barack Obama, Shakira and Bruno Mars. Ek explained that the new Follow Tab lets you connect with friends, artists and celebrities for music recommendations. For example, when Bruno Mars is writing a new record, he’ll share with his followers what he’s listening to during the process. Spotify has basically taken social elements of Facebook and encouraging music fans to connect with their favorite artists directly on Spotify, rather than driving them to connect elsewhere. As part of its new Follower system, Spotify is introducing push notifications, which artists can use to share new songs with fans. 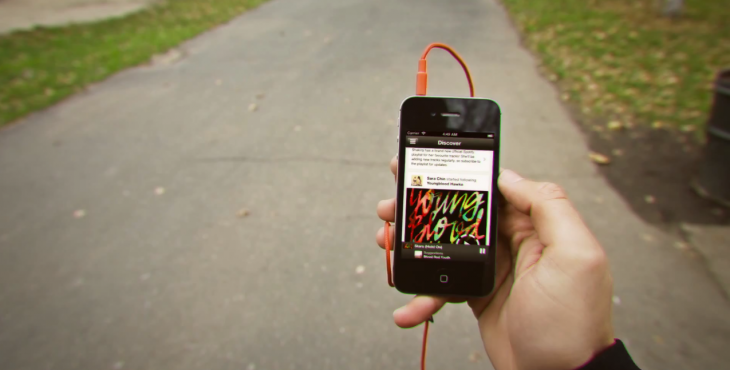 Other new features will include song previews and recommendations based on your age. This news reiterates previous leaks which detailed Spotify’s plans to release enhancements to its existing, but limited following system. Aside from integrating with Facebook’s social graph, Spotify was very much still to conquer the social experience. As we previously explained, one of Spotify’s greatest weaknesses was its inability to surface interesting and relevant artists and songs from its vast catalog of music. These new features are aimed at resolving this issue and bringing the service a stronger uptick in usage as it veers into social network territory. Today’s news follows Spotify’s beta launch of its browser-based music app, which is currently only available to a “small number of users.” Spotify confirmed its Web player with TNW, explaining that it’s “potentially…a great additional feature for times you can’t play music through the desktop app, like at work or at a friend’s house.” More details on the Web player will surface next year, the company said. In addition, Spotify’s $3 billion funding round closed last month, and the company counts Goldman Sachs, Fidelity, and Coca-Cola as investors. Spotify also recently revealed a list of its most streamed songs of 2012, which included Gotye’s Somebody That I Used To Know and Carly Rae Jepsen’s Call Me Maybe. Last, but by no means least, the company also announced that Metallica is coming to Spotify.